I mentioned a week or two ago that I made Lofthouse style cookies for Ben to take to work. I didn't intend on posting it here, so I didn't take any pictures. Everyone at the office was requesting more, so I whipped up a batch today and even remembered to take a few pics! I originally found the recipe while browsing Pinterest...imagine that ;) The original recipe is HERE if you want to read any comments about the cookies! In the bowl of a stand mixer, cream the butter and sugar at medium until light and fluffy (I used the paddle attachment). Add the eggs, one at a time until thoroughly mixed. Add the vanilla and sour cream and beat on low until combined well. Mix in the flour, baking powder, baking soda, and salt until combined. The dough will be extremely sticky! Flour your hands and divide the dough into 3 parts. Wrap each in plastic wrap and place in the fridge for at least two hours until firm (I place mine in the freezer for about an hour). Once the dough is firm, preheat the oven to 425. If you are not using non-stick pans, you may want to use parchment paper or spray with nonstick cooking spray. Transfer to a wire cooling rack and allow to fully cool before frosting them. Pull out more dough from the fridge, and repeat until they are all cooked and cooled. While the cookies are cooling, begin the frosting. In your mixer, cream together the butter and vanilla. Slowly add in the powdered sugar, 1 cup at a time. Once it is smooth and creamy, add the heavy cream in 1 TBS at a time until the frosting reaches a desired consistency. Split into smaller bowls to add food coloring (if using different colors), or add drops into the bowl directly if they will all be the same color. Frost completely cool cookies and then add sprinkles. Allow the frosting to completely set before serving. Store in an airtight container. Warning: This will make a TON of cookies. I got 44 out of this batch! There ya have it! Homemade deliciousness! 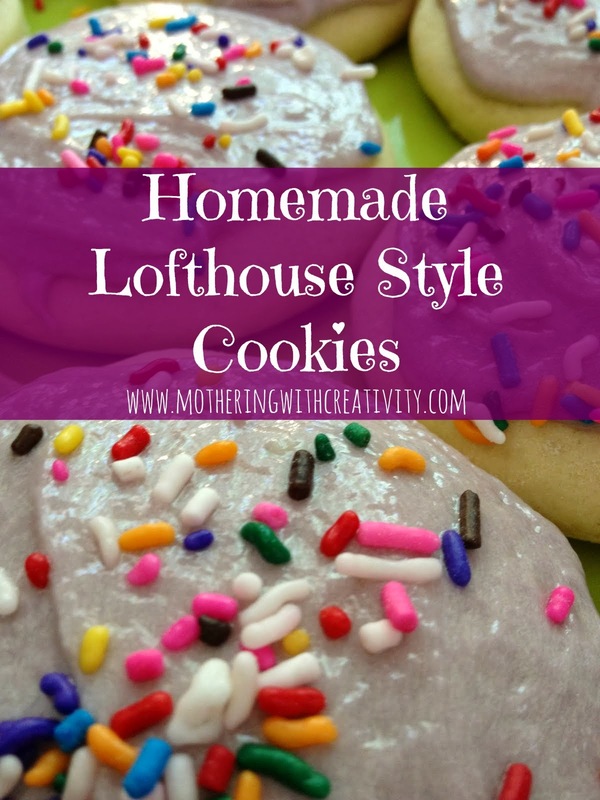 Lofthouse style cookies at home...what could be better?